Here are nine apps to help special ed students of all ages build emotional literacy, learn self-regulation, and focus on problem solving and task planning. Social and emotional learning (SEL) is the cornerstone of emotional intelligence, as these abilities do not come naturally for some special education students. Children in special ed settings need to have their confidence, courage, and emotional awareness nurtured in order to successfully play, work, cooperate, and be productive in their studies. We have all heard that technology can be a great playing-field leveler in a classroom with diverse learners. It can also assist in providing social and emotional skills. Let's face it -- the digital lifestyle is here to stay, so using digital technology to enhance SEL makes perfect sense. However, I have yet to encounter research that focuses on the effectiveness of using apps designed solely to enhance the social and emotional health of children. Researchers and educators have only begun to closely investigate the impact of these technologies on SEL. For special ed teachers, that research can't come soon enough. Young children acquire and utilize their initial social skills mostly in the context of play and shared activities. Through play, they form their first interpersonal interactions and develop important social skills related to empathy, cooperation, conflict resolution, and self-control, which will be used throughout life to maintain healthy relationships with others. Several apps can be used in the classroom or at home to assist in reinforcing social and emotional learning while also helping kids cope with the pressures that we all face. These apps can help teachers and parents in addressing students with special needs, and many are also available in a web format. Breathe, Think, Do (Sesame Street) teaches children to keep calm and carry on by introducing three possible strategies for working through problems. It touches on familiar emotional challenges such as problem solving, self-control, planning, and time on task. Intended for very young children, this simple app gives players different scenarios in which the Blue Monster character needs to regulate his or her emotions using the breathe-think-do technique. Touch and Learn -- Emotions (Innovative Mobile Apps) is chock full of wonderful photographs representing four different feelings per page. The child is prompted to match the verbal cue with the appropriate photo. This app focuses on helping kids read body language and understand emotions by looking at pictures and figuring out which person is expressing a given emotion. Avokiddo Emotions provides opportunities for younger children to explore a wide range of feelings through several silly characters and a plethora of props. This app incorporates activities to help children understand the subtle cause and effect of facial expressions. The main idea is exposing young children to a variety of feelings and helping them grasp emotional connections with those feelings. Emotionary (Funny Feelings) is designed to give a wide age range of kids the tools and skills to express themselves well in our world of emoticons. 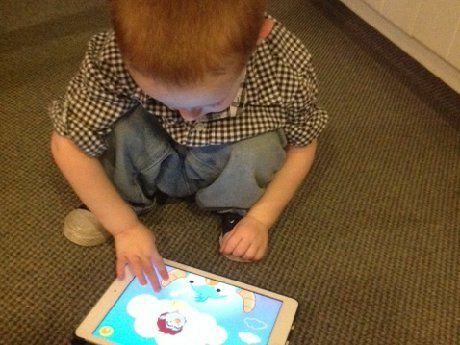 The app has become a popular resource for the special needs population. This collection of emotions and funny feelings now allows users to draw their own emotionary "selfie" to match how they are feeling. GoNoodle is a wonderful web-based way to get younger kids out of their seats and moving. These short physical activities provide brain breaks that can help keep them focused throughout a long day. Studies have shown that physical activity increases blood flow, which increases concentration and attentiveness. This enhances students' ability to acquire and recall information. These activities make them cross the mid-line of the body, engaging both sides of the brain. GoNoodle provides teachers with fun, interactive ways to get kids moving and feeling good about themselves. IF. . . The Emotional IQ Game (If You Can) promotes teamwork and collaboration, accentuating how to be in touch with our own feelings and the feelings of those around us. With this app, kids (recommended ages 9-11) learn to listen, make friends, and deal with bullying in an adventure story/game format. IF's motto: "Play Learn Grow: Succeed at school with friends in life!" This pretty much says it all. The Middle School Confidential series is a powerhouse of SEL lessons by tween/teen expert Annie Fox. The book/app series for ages 8-14 is a graphic novel sequence focused on making stepping-stones out of stumbling blocks on the road to becoming a teenager. Readers follow the adventures of a group of seventh-grade friends trying to navigate the ever-changing drama of their friendships, families, and school. Excellent resource! Stop, Breathe & Think (Tools for Peace) promotes mindfulness, meditation, and compassion for middle and high school students and adults. Research has shown that people can develop kindness and compassion by focusing on them through mindfulness and meditation practices. You can cultivate your frame of mind in a very short timespan with simple meditation. I would be remiss if I didn't include the The Social Express in this collection of apps. Its quality content keeps students engaged and on the path to mastering healthy social and emotional skills. Research-based webisodes give kids the exposure necessary to develop meaningful relationships and become more socially competent in all realms of life. This program covers the gamut from preschool through high school with a robust SEL curriculum. Most students with or without disabilities can and do benefit from SEL-focused technology in the classroom. Incorporating these tech tools should increase student incentive to learn through individualized lessons, especially when tailored to a student's specific needs. When done well, tech not only reinforces key SEL skills that children need to learn, but it can also drive student enthusiasm and promote self-assurance. This topic may seem like an oxymoron since we want children to learn how to focus during "real time" and how to live with less tech. A wonderful TED Talk addressing this conundrum is Sherry Turkle’s "Connected, but alone?" Do you know of any digital SEL resources for special education students? Please tell us about them in the comments below.